Body composition is one of the best indicators of health – reflecting both physical activity and dietary practices. Over time, people tend to gain fat and lose muscle without an obvious change in their weight. By accurately measuring body composition, one will immediately know the amount of fat vs. lean tissue that makes up their weight. Excess body fat has been found to increase the risk of diabetes, heart disease and some cancers. Lean mass primarily consists of muscle, takes up less space in the body, and burns calories more efficiently. Knowing your body composition enables you to make sensible decisions regarding diet and exercise programs. 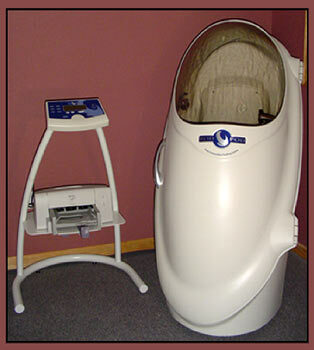 The BodPod is considered to be the gold standard for measuring body composition. It uses air displacement to measure body fat and lean muscle mass, making it one of the most accurate methods to determine body composition. Testing your body composition is easy with the BodPod. First, the person is weighed. Then, he or she enters the BodPod and sits comfortably during a brief forty-second measurement period. The BodPod uses computerized pressure sensors to measure the amount of air displaced by the person’s body. The test is repeated to ensure accurate results. Your results will be printed immediately, showing your percentage of fat vs. lean tissue, fat weight vs. lean weight, and total weight. A complete test can be done in less than 5 minutes. During your visit, you will be instructed on the correct use of the BodPod and a staff member will be available to answer any questions. You will have the privacy of changing into appropriate clothing (undergarments) and will follow the BodPod computer prompts to begin testing when you are ready. Please call 303-426-5600 to schedule an individual or group visit. Visit the Colorado BodPod Facebook page, created exclusively for communications, updates and promotions for Body Composition Testing at Sandusky Chiropractic.